(1) Project Nursery (2) Paper Plane (3) Living (4) Project Nursery. When you live in a small space, creativity is a must. Need help making room for baby? Whether you have too little closet space or none at all, these clever DIY closet solutions offer the perfect workaround! Need a new closet on a small budget? Skip the expensive store-bought wardrobe, and try this simple DIY. Start with a tall and sturdy bookshelf. Hit a few garage sales or comb through your local flea market for a bargain. Once you’ve found the perfect piece, remove the inner shelves and install a clothes rod kit. 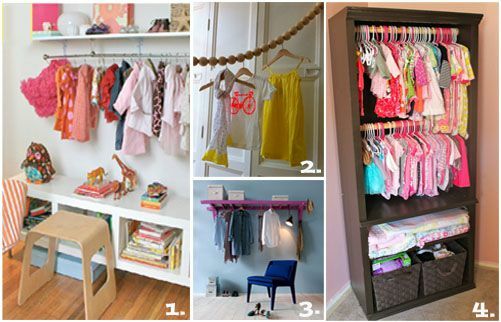 If your bookshelf is tall enough, consider doubling your little one’s closet space by installing a second rail. You could also choose to leave the bottom shelves in place, creating space for a few cute storage baskets. As with all tall furnishings, don’t forget to anchor your new wardrobe to the wall. A chic curtain rod mounted to the bottom of some inexpensive, industrial shelving creates a stylish storage solution with a modern, baby-boutique feel. Display shoes or store other accessories in attractive shelf-top boxes, adding the occasional decretive accessory to re-enforce the clothes as décor concept. 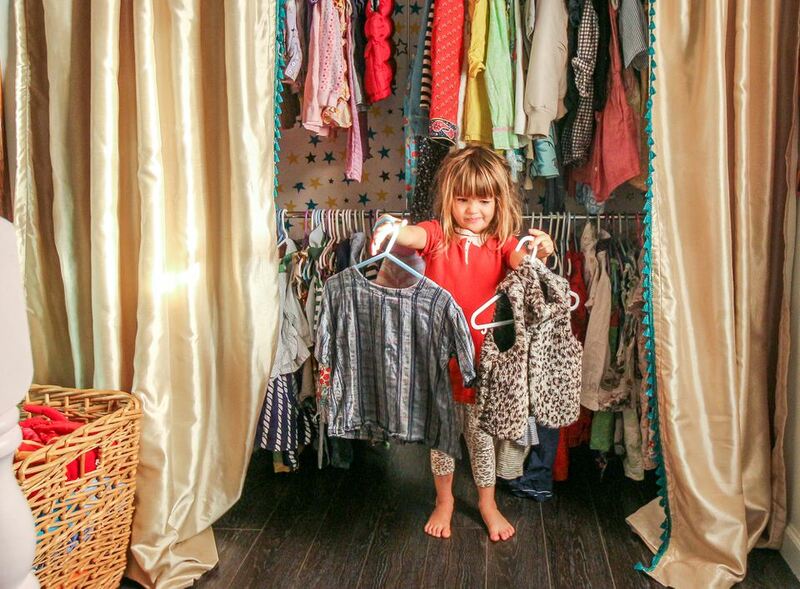 For an even bigger statement, organize that pint-sized apparel by color. With a little know-how and a length of pretty material, you could easily recreate this charming circus-tent storage rack, formally available from The Land of Nod. Simply purchase an inexpensive storage rack, and get sewing. You could even create an entire tented wardrobe using a cheap, portable closet frame. This clever clothesline prevents hanger slippage, ensuring clothes stay put instead of bunching up near the middle of the line. Create your own version using curtain hardware and store-bought crafting beads, or for a more simple approach, try draping a beaded garland across several ceiling hooks. Put your baby’s finest threads on display by creating a stylish one-of-a-kind ladder rack. Given a bright coat of paint, an old-fashioned, wooden ladder makes for a playful clothes rack that’s perfect for a nursery or kid’s room. Mount your ladder horizontally using heavy-duty shelf brackets, or stand it up against a wall (anchoring near the top) and hang those itty-bitty outfits from each individual step. Just be careful your little monkey doesn’t confuse your creation with playground equipment! Have a little explorer with an unruly wardrobe? This kid-friendly, travel-themed closet may be just the ticket for keeping your little one’s adventure-themed room ready for action. Simply stand a large steamer trunk on its side, and install a clothes rail. Be sure to anchor the trunk to the wall to prevent accidents. For an authentic look, pair your creation with a set of these adorable storage cases from the Land of Nod. Have a large playroom with a serious lack of storage? Clear away the clutter with this simple —and beautiful — solution. Create a false wall by hanging wall-to-wall curtains from a ceiling-mounted track; then, install inexpensive industrial shelving to keep toys, and games under control. While architectural features like nooks and slanted walls give a room character, they can also result in a lot of wasted space. Need some additional storage? Put that square footage to work! Use curtains to close off unused areas, creating an impromptu closet for clothes, toys, and anything else you’d prefer to keep out of site. Longing for a large, built-in closet? This clever DIY may just be the next best thing. Purchase a tall and sturdy bookshelf. Place the bookshelf several feet away from and parallel to a wall. The unit should face outward, anchored to the adjacent wall by its side. Then install a clothing rail between the back of the bookshelf and the wall. Enclose your new closet with a curtain. Whether you dream of turning an existing closet into a hide-away workspace or cozy reading nook for your little one or simply long for the luxury of a large closet, a loft bed may be just what you need. A great space-saver, loft beds allow you to reclaim the square footage formally occupied by the bed and put it to good use. Purchase a model with additional built-in storage, or use the extra space to create a luxurious walk-in.